One thing about a civilization: people are always building things or buying & selling things. The Egyptians built some impressively big things. When you’re putting together something as big as a pyramid, you need to get all the measurements right. The Egyptians traded things as well. If you’re selling or buying a plot of land, or a roll of fabric, or a quantity of wheat, both buyer and seller need to agree on how much is being traded. What you need are standardized measurements. Before the Egyptians started building a pyramid, they had to figure how big the base of it would be so that the sides could come to a point at the top at the right height. If an Egyptian were buying a roll of fabric, she’d need to use the same measurement as the seller to describe how much fabric was being sold. What do you do if you don’t have a ruler or a tape measure or a yardstick? Or, what if you have a ruler or a tape measure or a yardstick but yours is different from somebody else’s? 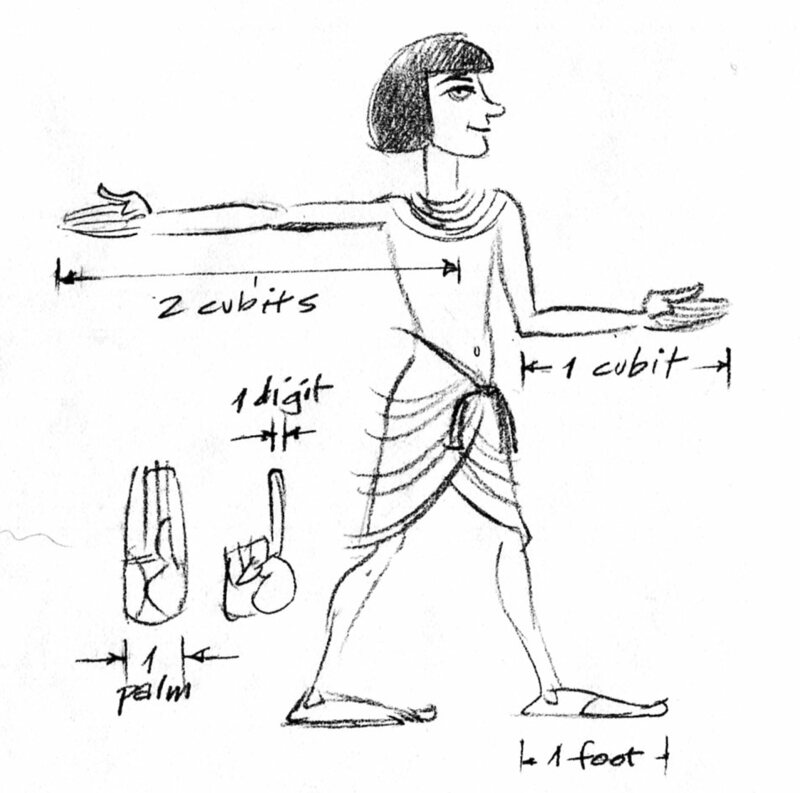 Here’s what the ancient Egyptians did: they used the good old human body for measuring. The length of a grown man’s forearm—from elbow to the tip of the middle finger—is more or less the same length as every other grown man’s forearm. This measurement was known as a ‘cubit.’ The Latin word ‘cubitum’ means elbow. In the Hebrew Bible, cubits are used to describe the size of Noah’s Ark, or how tall Goliath was, or how long to make the curtains for the Tabernacle. From the middle of a man’s chest to the tip of his middle finger is two cubits. From fingertip to fingertip of both outstretched hands is four cubits. Using a grown man for measuring. One ‘palm’ equals 4 digits (fingers) of a grown man’s hand. There are 7 palms in a cubit, or 28 digits. A digit is roughly 3/4 of an inch. A palm is just under 3 inches. That’s how the Egyptians standardized their measurements. You can find grown men just about anywhere! If not, they had cubit rods marked with cubits, feet, palms and fingers. This entry was posted in book promotion, Western Civilization and tagged civilization, Egypt, history, measurement, pyramid, Western Civilization. Bookmark the permalink.